Disclaimer: This is a sponsored post from My Patriot Supply. I received a free 72-Hour Kit from My Patriot Pantry in 2017 in exchange for my honest opinion. All opinions are my own. There are also links below to products I recommend from companies I have a referral relationship with. I will be compensated if you make a purchase after clicking on my links. Preparing for short-term emergency disaster survival is important because these tend to happen frequently. What Is A Short-Term Emergency? It is not uncommon for many people to deal with short-term emergencies – such as losing power for a day, severe weather hitting the area where you live or having a health emergency. Under normal circumstances, these pass fairly quickly. When a short-term disaster strikes unless you are prepared, you could find yourself in a bad situation. Weather emergencies such as blizzards, floods, hurricanes, and tornadoes are the top four causes of short-term disasters that people are forced to deal with. These disasters create situations where you often end up without any lights, heat or air conditioning. Without electricity, most people have no way to keep their food supply from spoiling, which is sad because there is often a rush on food at the grocery stores when one of these disasters are forecast. Grocery stores end up with empty shelves, leaving those who are unprepared without a way to get food. Often the shelves remain bare for several days after the disaster passes until semi-trucks can get to the stores with additional supplies. Without electricity, you lose the ability to call out for help if the battery your cell phone dies. Often there is a need for help due to emergency health issues or even looting. Make sure you have a first aid kit – while you have electricity – while you have the food you need and the means to get ready for what might come your way. Prepare now by creating your own 72-hour short-term emergency preparedness disaster survival kit. In that kit, you need water for every member of your family, pets included, and enough food to last everyone for at 72-hours. 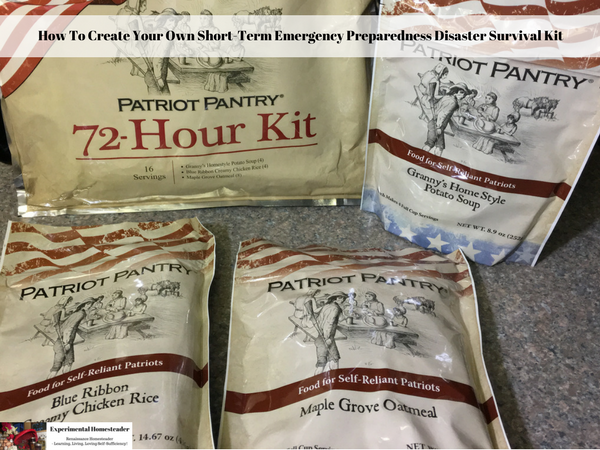 I recommend starting your short-term emergency preparedness disaster survival kit with the 72-Hour Kit from My Patriot Supply because it has a 25-year shelf life as long as it is unopened and the food is delicious! Short-term disasters often last longer than 72 hours, however, so setting your kit up to last a week is even better. Make sure you have a first aid kit that includes face masks and all prescription medications. Make sure to include any special infant and or pet needs as well as medications in your kit. Keep antibacterial wipes with the kit. Add copies of sealed personal ID’s to the kit. In the event your original ID’s are destroyed in the disaster, you’ll have a backup copy that will save you from a future hassle. You will need waterproof matches, a hand held can opener, a multi-tool and a whistle just in case you need to be heard from a distance, so be sure to add those to your kit. Keep all of your supplies together in an air-tight waterproof container or bug out bag. Store the container where it is easily accessible and the temperature doesn’t vary. There are places that offer readymade disaster kits – and some people choose to buy those instead of making their own, however, when you make your own you choose what foods and supplies are in it. If you choose to buy a readymade kit, don’t forget to add copies of your important paperwork and any medications, etc. that you or your family need. You need a way to keep warm – especially if the disaster is during the colder months. Keep thermal blankets and waterproof sleeping bags handy so you can quickly grab them if you need them. Extra blankets are great to keep to hand to wrap your refrigerator and freezer with so the food inside does not thaw as quickly. Have flashlights and radios on hand that run on batteries and keep extra batteries ready. Or, invest in the hand crack variety. An alternative heat source – such as wood or kerosene – along with fuel to keep it going is recommended. Being prepared for short-term emergencies is the first step towards survival prepping. Remember, there is nothing wrong with taking baby steps to get where you want to go and the sooner you start, the better. It is also easier to prepare for disaster survival on a budget when you start with a short-term kit then work your way up.